Whatever you think the "other" kind of poetry is, and whether you hate that kind of poetry or not, I hope you'll take a look at my essay "Hating the Other Kind of Poetry" in the latest issue of Copper Nickel. It's also available online here. 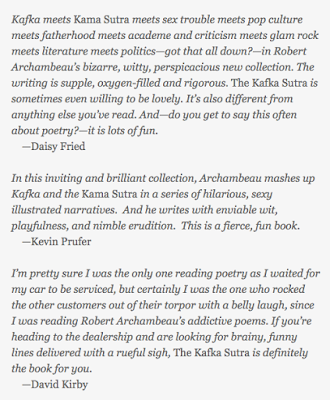 The Kafka Sutra, Available Now! Hey hey! 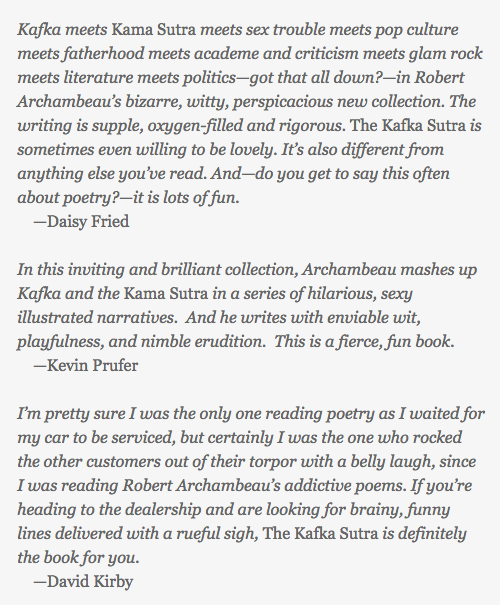 The Kafka Sutra is now available for pre-order at the MadHat Press website! A bargain! A great gift for all occasions! 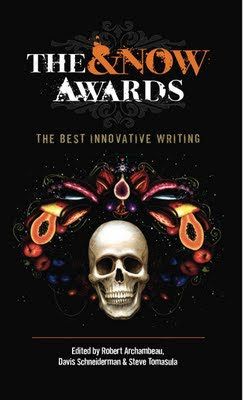 With images by Sarah Conner and a cover by Kriss Abigail! Get 'em while they're hot! Andrei Codrescu likes it! Daisy Fried too! 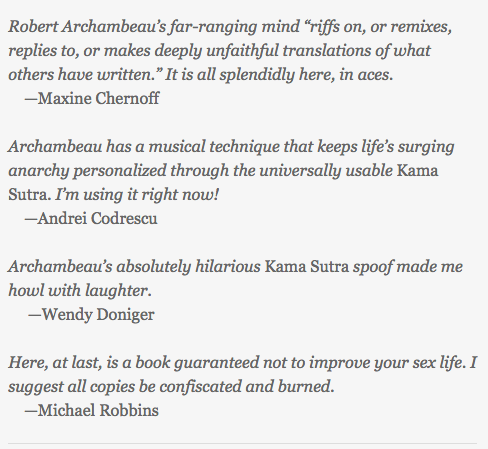 Michael Robbins wants all copies burned! 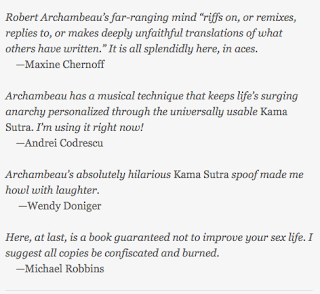 Can all these blurb writers be wrong? Find out! The good people at MadHat have also posted a short bio correctly describing me as having the world's least interesting trans-national identity. You’ve got to be kidding me. Really? You haven’t heard of Papirmass? Don’t worry, people, I’ll fill you in. Papirmass is sort of like a literary journal, if a literary journal were an art gallery. They send you twelve nicely made art prints a year, of variable size and ready to frame, and in one way or another include something literary along with it—a chapbook sometimes, or poems, sometimes on the verso side of the print. It’s a grand idea, and if it were based in Brooklyn rather than Canada you’d have been hearing about it for a long time (they’re on their 69th issue). I’ve been thinking about the current issue because it’s managed to deliver something quite rare: a list poem I actually like. 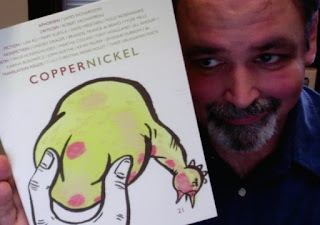 I don’t know why I’m a hard sell when it comes to list poems—maybe it’s because they’re such a staple of the creative writing classroom that I’ve seen too many that are either merely workmanlike or strive a little too hard for novelty. Certainly there are exceptions—if we’re calling Joe Brainard’s I Remember a list poem, then I’m a fan of at least one large scale list poem. 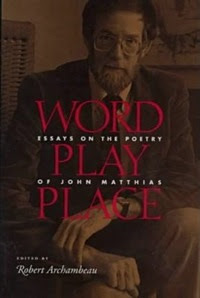 But generally, when I sit down with a list poem, the thing is considered guilty until proven otherwise. I know. It’s not fair. 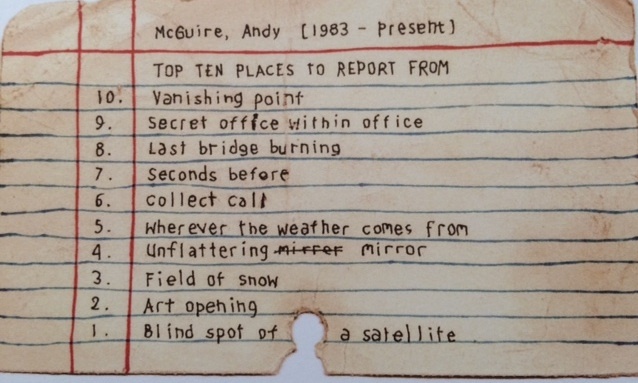 But Andy McGuire’s set of four list poems in the latest Papirmass (printed on the back of “Reflet,” a photo by Sarah Bodri) overcame my resistance. I think I understand why. 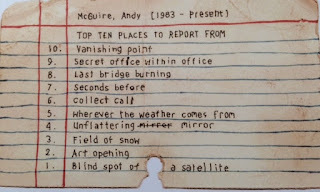 To begin with, there’s what we see at first glance— McGuire’s lists take advantage of Papirmass’s ability to present the written word in a visually interesting manner. The lists appear on old library index cards, yellowed and ruled in blue and red, with holes punched for the old catalog box rods. There’s a nostalgia value, even for my generation—I am of that unfortunate generation that came of age with the microfiche library catalog, a brief transitional technology between the card catalog and the fully electronic index, but we still used the card catalog when all of the fiche readers were engaged, and the sense memory of how it felt to thumb through those old cards is real enough. 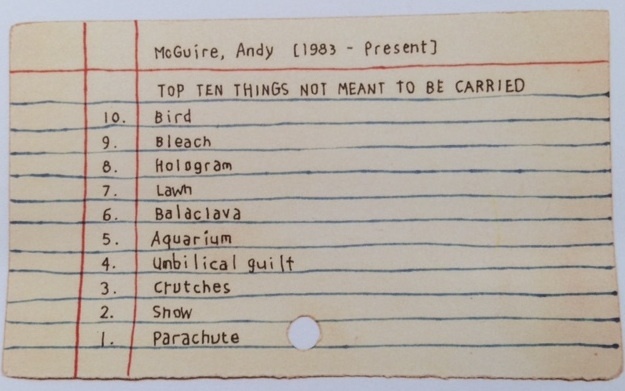 It’s not just nostalgia that we get from the images of lists on these cards, though—there’s a kind of pathos, especially since McGuire has chosen to have the text appear handwritten. We get something like the feel Wes Anderson works so hard to give us in his films, where a character like Dignan in Bottle Rocket will reveal large binders of handwritten, naïve life plans—there’s a sense of how hopelessly outgunned we are by the world when we attempt to impose order on it. For Wes Anderson, the maker of plans andlists seems like a lost child grown old. 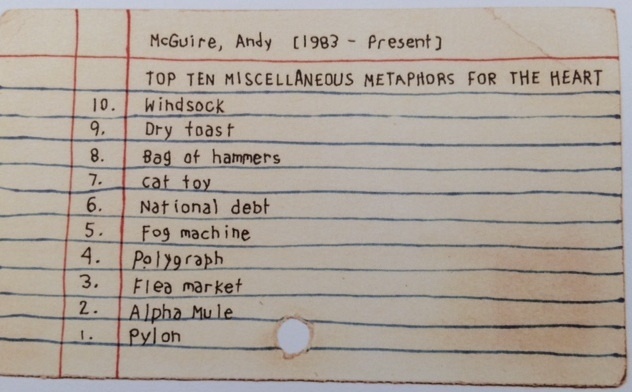 It’s an important part of the Wes Anderson aesthetic, and more than incidental to the feel of McGuire’s list poems. They’d lost a lot if they appeared conventionally printed in an ordinary literary journal. The idea is to show the confusion of ideas, the variety of ways knowledge can be structured, and the failure of consistency in the application of those varieties. Borges makes fun out of the very idea of categorization. 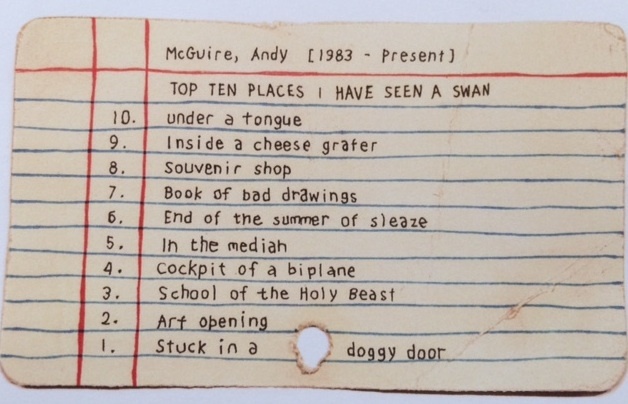 In a different way, Andy McGuire makes fun out of the idea of rankings. Rankings, after all, are meant to be rankings of things in terms of the same criteria—but he presents overtly non-comparable things in his rankings. 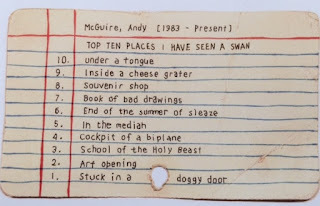 In “Top Ten Places I Have Seen a Swan,” for example, we get locations where an artificial swan might be found (“Souvenir shop”); places where what one sees isn’t a swan but a drawing of a swan (“Book of bad drawings”) (here the “bad” is sort of egregious, which is wonderful); places where what one sees may or may not be a real swan, and may or may not be there because people want it there (“Art opening”—how avant-garde is the show? ); places that are plausible but nevertheless incongruous for a goose (“Stuck in a doggy door”) and places that must be somehow surreal (“Under a tongue”). 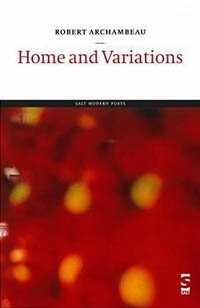 In a list poem, everything is about selection and juxtaposition, and McGuire’s juxtapositions are uncommonly clever, even charming. 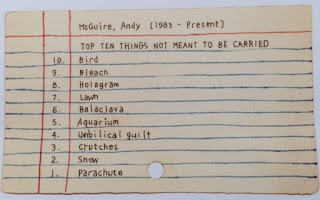 We get similar a similar feel from McGuire’s “Top Ten Things Not Meant to Be Carried.” When he tells us a bird isn’t meant to be carried, it feels right—those things squirm and really don’t want to be in your hands. But when he tells us a hologram or a lawn are not meant to be carried, the rightness of the assertion that they aren’t meant to be carried is predicated on different grounds (immateriality and non-portability, respectively). Then there are other items that simply don’t perform their intended uses if carried (balaclava and parachute). What we’re really getting is a kind of demonstration of the variability within our language—how “not meant to be carried” can apply to many different states. To rank these things implies that they are comparable (same in kind, different in degree), but the variety of things chosen shows how the same language applies to things that are not comparable. 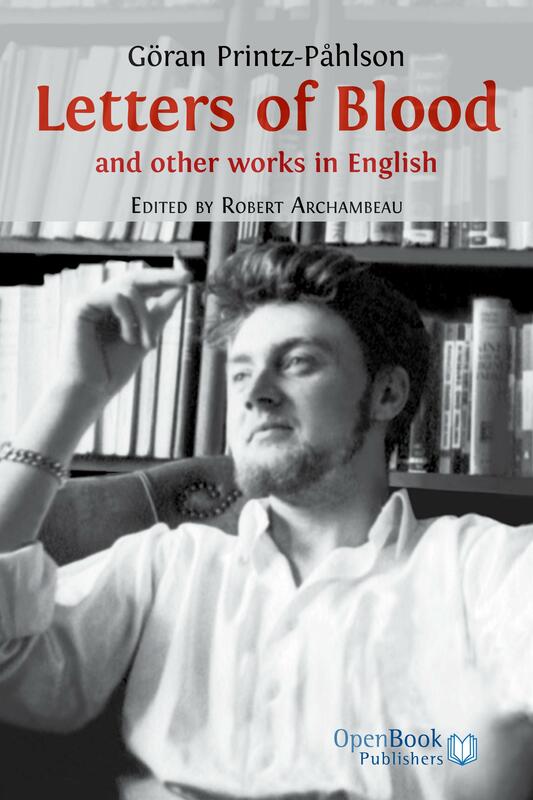 If I were a grad student, and it were the early 1990s, I would go on for paragraphs here about linguistic slippage, dropping the names of as many French theorists as possible. But you get the idea. 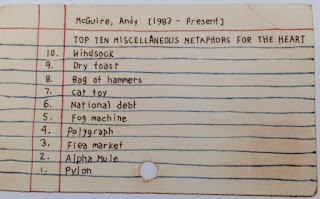 “Top Ten Miscellaneous Metaphors for the Heart” is a little different, since it deals with figurative language, and in a sense the listed items are comparable. 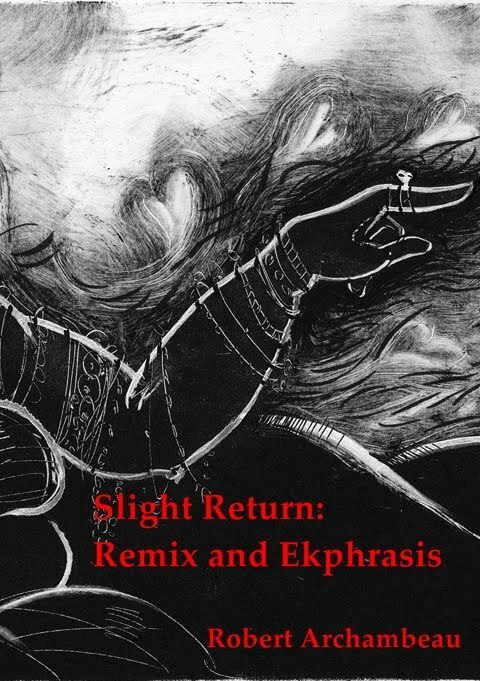 What’s nice, though, is the freshness of the metaphors, and the variety of ways in which each is accurate. Yes, the heart is a windsock, being blown this way and that, and yes, it is the national debt, owing ever more and more, and yes, it is a polygraph, on which the truth of our actions is proved, and yes, it is a flea market, full of random accumulations and broken things. McGuire is so sure footed here that I’m sure there’s a way the heart is an “Alpha mule,” too, though I’d first have to find out just what one of those is to confirm it. The final list, “Top Ten Places to Report From,” also shows the multiple senses of the seemingly simple language of the category. The place can be visually designated (“vanishing point”) or a matter of time (“seconds before”—there’s a nice implied narrative in that one) or ambiguous (“wherever the weather comes from”). 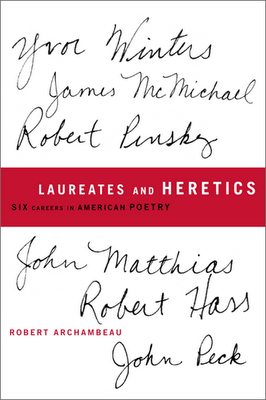 It can also be an “art opening,” the penultimate item in this, the final list—and a nice call back to the initial swan list, giving a satisfying sense of formal conclusion to an already satisfying piece of writing. If this is your kind of thing, and you’re ready to be surprised with a new art print in your mailbox a dozen times a year, give Papirmass a try. The umbrella term migrant is no longer fit for purpose when it comes to describing the horror unfolding in the Mediterranean. 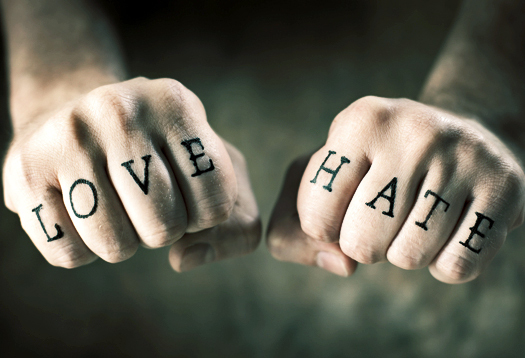 It has evolved from its dictionary definitions into a tool that dehumanises and distances, a blunt pejorative. It is not hundreds of people who drown when a boat goes down in the Mediterranean, nor even hundreds of refugees. 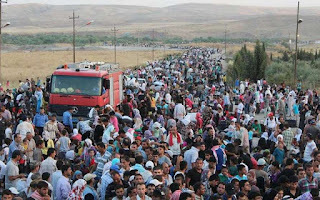 It is hundreds of migrants. It is not a person – like you, filled with thoughts and history and hopes – who is on the tracks delaying a train. It is a migrant. A nuisance. What we really have is a crisis, not of migrants, but of refugees. 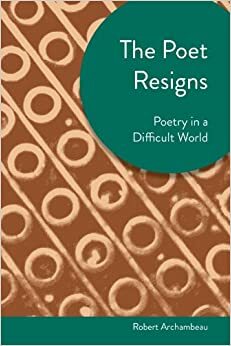 What can poetry do, in a time of such crisis? 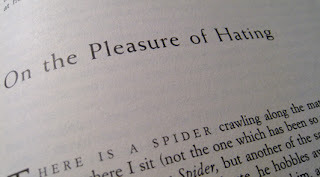 The question probably seems absurd to the more practical-minded, but it haunts poets at times like these. W.H. Auden addressed an earlier era's troubles in "Refugee Blues," a poem about Jewish refugees in the time of fascism, and Chinua Achebe's "Refugee Mother and Child" spoke to a crisis closer to our own time. The lines inked on the map are railways and roads. 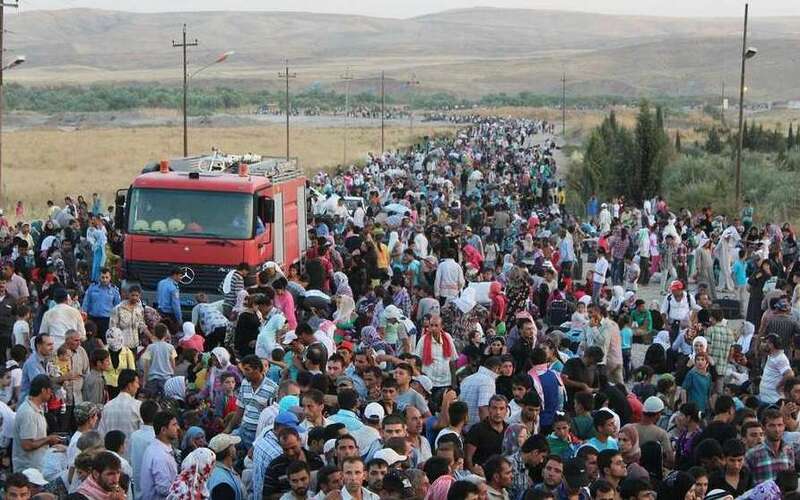 The lines on the road are refugees, and moving. The lines inked on the page are a poem, your poem. While you are singing, who will carry your burden? of hurt and proper names, their lost, their staggering. While you are singing, while you are singing. and reach for valleys where bodies cough, bleed, or stumble blind. They survive while you are singing. on a General’s table. Your lines are a poem. or not. Your lines are a poem. Who will carry your burden? The United Nations has a fund for aid to refugees. Help if you can.